If the iPhone X's price is too much for you to stomach, but you still want a big-screened iPhone, then perhaps the iPhone 8 Plus is the way to go. It has a 5.5-inch screen and an impressive camera, even if doesn't have the cache of the iPhone X. It's still not a cheap phone by any means, so you'll definitely want to peruse all the iPhone 8 Plus deals that you'll find here. Below you'll find deals from carriers like T-Mobile and Verizon, which include discounts on a second phone and offers for your trade-in. Further down the page you'll find unlocked options. If you'd rather purchase directly from Apple, you can expect to pay $799 for the 64GB model or $949 for the 256GB model, but you can get up to $315 in credit when you trade in your old iPhone. Don't need such a big phone? 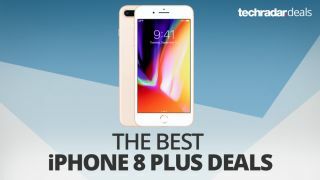 Check out these iPhone 8 deals. T-Mobile doesn't offer any discounts on the iPhone 8 Plus, but if you're in the market for two iPhones, you can get $700 off a second iPhone 8 when you purchase the first and trade-in an iPhone 7 or newer iPhone. Otherwise, it's $799.99 for the 64GB version, which you can pay for in 24 monthly payments of $30 with $79.99 due upfront, or $949.99 for the 256GB model, payable with $229.99 down and $30 per month for 24 months. Like its competitors, Verizon doesn't discount the iPhone 8 Plus, but you can save on this iPhone if you trade in your old phone and sign up for the carrier's unlimited plan. If you trade in a flagship phone, you'll get 50% off for payments of $16.66 ($399.84) for the 64GB and $22.91 ($549.84) for the 256GB. But you're probably more likely to get a 35% or 25% discount when you trade in one of the older eligible phones. And if you switch from another carrier, you'll get a $150 prepaid card. AT&T doesn't discount the iPhone X, but you can get a low monthly payment — $23.34 for the 64GB model or $31.67 for the 256GB version — with $0 upfront because the carrier has 30-month plans instead of 24 month commitments. However, you can also get a $700 credit towards a second iPhone when you purchase the first and sign up for the AT&T Next wireless plan. Like the other big carriers, Sprint also doesn't discount the iPhone 8. But it also offers a BOGO deal; when you lease an iPhone 8 Plus for 18 months, you'll get a 64GB iPhone 8 lease for free (essentially a monthly credit). You can lease either version of the phone for $33.34 per month for 18 months, with nothing due upfront for the 64GB version and a $150 down payment required for the 256GB model. This lease is part of Sprint's iPhone Forever program, so anytime after 12 months, you can purchase the phone for the remaining balance or trade it in for a new model. Boost is currently the only carrier offering a discounted deal on the iPhone 8 Plus. You can save $100 on either the 64GB or 256GB model for prices of $699.99 and $849.99, respectively. Unfortunately, you will have to pay for this phone upfront, and it can only be unlocked after 1 year of Boost Mobile service. The short answer is $799. That's what Apple charges for the 64GB iPhone 8 Plus, available in silver, gold, or space gray. Of course, if you need more memory, then it's going to cost you more; your only other option is spending an extra $150 and grabbing a $949 256GB iPhone 8 Plus. As we've outlined above, there are ways to get a deal, or at the very least, break your cost out into more manageable monthly payments (also available via Apple).